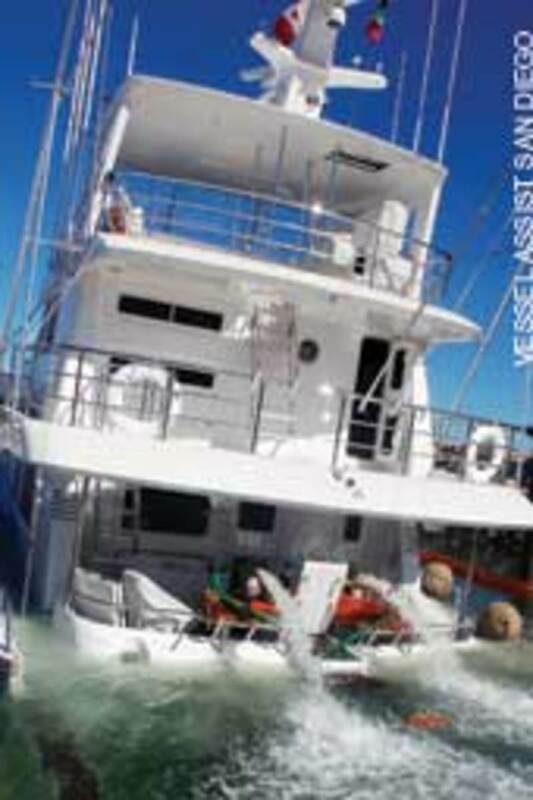 A Nordhavn 75 Expedition Yachtfisher that sank at its slip in San Jose del Cabo, Mexico, was a casualty of a PVC fitting the builder says popped loose from a tuna tube bait-fish system, flooding the engine room and lazarette while no one was aboard. 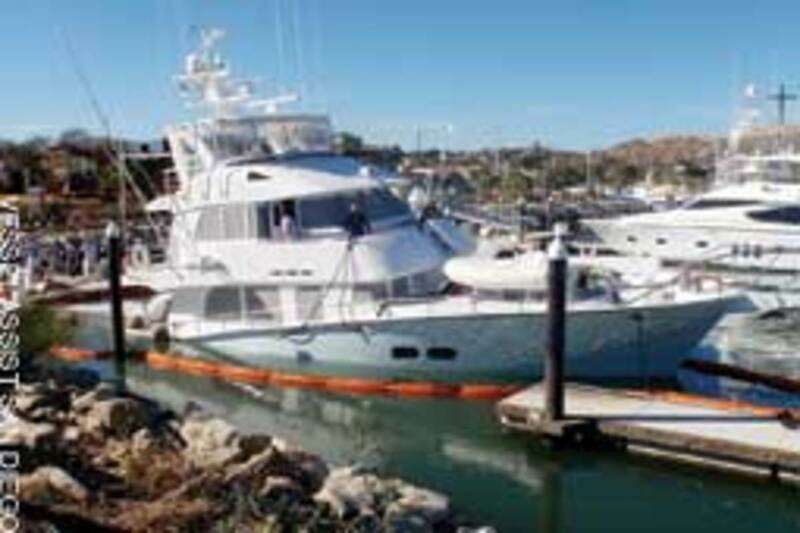 The 2-year-old, $4.5 million Melanie Jeanne sank at about 10 p.m. Feb. 3 in its slip at the Puerto Los Cabos marina - bow up - as 9,200 gallons of water an hour poured in. In the days after the sinking, Internet forums were awash with questions: How could it happen? Why couldn&apos;t the bilge pumps keep up? Didn&apos;t anyone hear the bilge alarm or see the yacht&apos;s powder-blue hull listing at its slip in San Jose del Cabo&apos;s newest and most modern resort marina? Did a flaw in Nordhavn engineering contribute to the sinking? A tuna tube is a plumbed PVC pipe in the cockpit into which anglers slip a bait fish head-first to keep it alive. 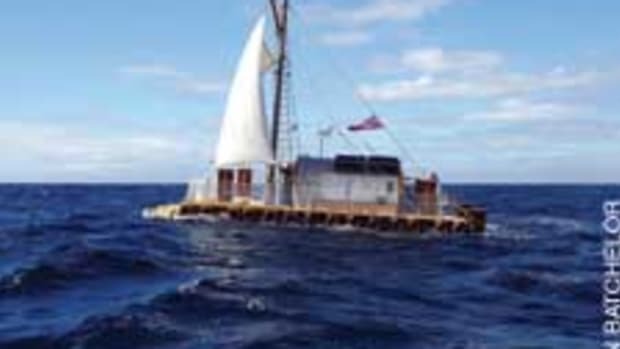 In a report to the Nordhavn Dreamers forum, Jim Leishman, a vice president and principal of Nordhavn builder Pacific Asian Enterprises, says the tube and the plumbing that delivers water to the tube - which washes over the fish&apos;s gills and leaves through a fitting at the top - were "conceived, designed and installed" by contractors in Mexico with no PAE involvement. "A boatyard down there did the work," Leishman says. "That was bad decision-making. It was bad workmanship. ... That fitting was just not something I would want to bet my life on." He says the installation included a 2-inch-diameter bronze through-hull 3 to 4 feet below the waterline, a large centrifugal pool pump mounted under the engine room floor and plumbed directly to the through-hull, a short length of PVC pipe with a threaded collar that screws over the male threads of the pump outlet, and a sanitation hose running from the pipe&apos;s open end to the tuna tube. Vessel Assist San Diego refloated the 270,000-pound yacht three days later, but before the salvage occurred a diver entered the engine room and found that the PVC collar, "similar to what&apos;s commonly seen on the bottom of a kitchen sink drain," had "popped off" the pump outlet, letting water pour into the engine room through the pump. Wrench marks and sealant on the collar suggest that the fitting had been leaking and had been tightened repeatedly, Leishman says. The diver also found the seacock on the through-hull open, and the watertight door between the engine room and the lazarette had been left open. Had that door been closed, the flooding would have been confined to the engine room, which is sealed by watertight bulkheads, Leishman says. Confined to the engine room, the flooding would not have sunk the yacht, he says. It was a windy night - about 30 knots out of the north - and it was a Thursday, so there weren&apos;t many people on the docks. The bilge alarm likely would have been audible in the pilothouse, but Leishman surmises that it was drowned out on the docks by the noise of the wind. He says a security guard saw Melanie Jeanne listing but thought it was from the wind. "It was kind of a perfect storm," Leishman says. A loud outside bilge alarm might have alerted someone to the problem in time to save the boat, he says, but the vessel was locked. No one could have gotten inside without help from the crew. Melanie Jeanne&apos;s loss set off a firestorm of online debate about what constitutes sufficient bilge-pump capacity. Leishman says the engine room and lazarette - as separate compartments - each have a 120-volt AC positive displacement pump that can run on batteries and an inverter, or on shoreside or generator power, and a DC centrifugal pump, each automatically tripped by a float switch. Figuring in the reduced capacity of the centrifugal pump because of head pressure - the resistance to pumping water uphill 7 feet from the bilge to the waterline to discharge it - the combined capacity of the two "nuisance-water pumps" in each compartment is 1,300 gallons an hour, Leishman says. These pumps are designed to handle water accumulating in the bilge from condensation or slow leaks, maybe from the propeller shaft packing gland, or a leaky port, hose or fitting. 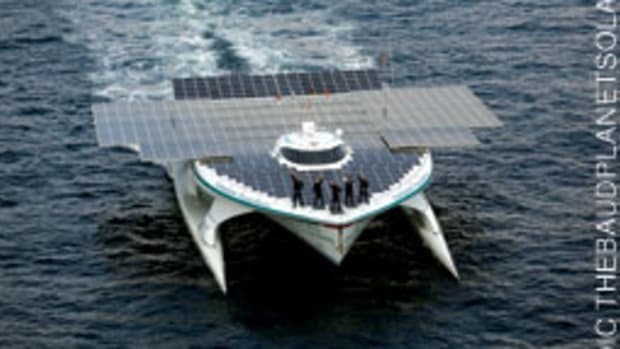 The yacht also is fitted with an emergency hydraulic-driven pump with a capacity of 10,000 gallons an hour and suction lines running to each compartment, and a backup 240-volt AC centrifugal pump of similar capacity. The emergency pumps are manually activated, and the hydraulics for the main one run off the engine or generator. Leishman stresses that Melanie Jeanne&apos;s pumping capacity meets American Bureau of Shipping standards. 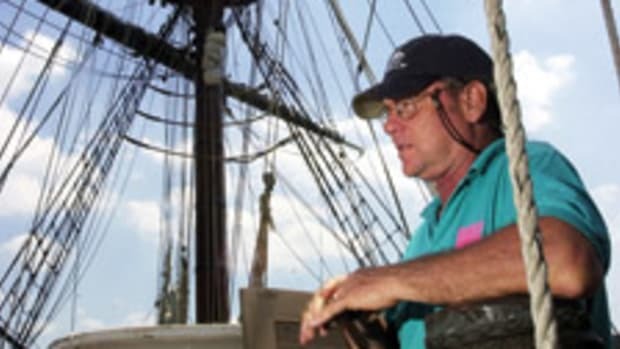 He says he has built more than 1,000 boats over 38 years and has never seen a dockside sinking such as this, in which "you suddenly have a 2-inch hole appear - unobstructed." "In this case the &apos;unattended bilge pumping&apos; capacity could have been doubled or tripled, and the results would likely have been the same," Leishman writes in his analysis of the sinking. "Had people been aboard, the pumping capacity of the large hydraulic and 240-volt electric pumps could have kept up. However, if the hole was 4 inches instead of 2, they could not have. Ultimately the best safeguard against this type of accident is the use of watertight bulkheads." Marine supplier West Marine, in its West Advisor, warns its customers, "Virtually no boat has a bilge pump system which is large enough to keep up with a leak caused by hull damage. ... 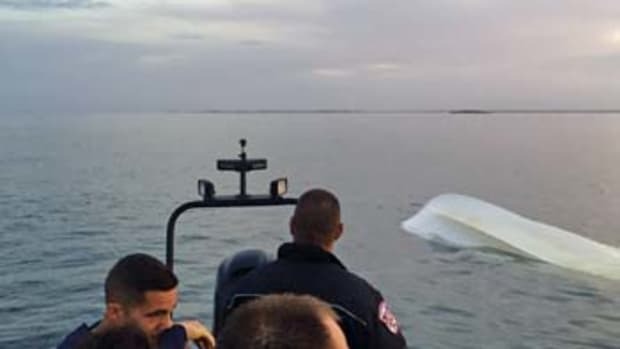 The American Boat and Yacht Council standards for electric bilge pumps state that they are &apos;intended for control of spray, rainwater and normal accumulation of water due to seepage and spillage.&apos; "
Yet the Melanie Jeanne&apos;s sinking has mariners thinking. 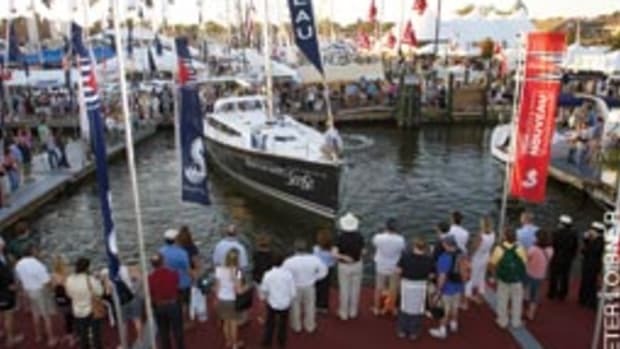 Steve Dashew, who also designs expedition power yachts, weighs in on his website (www.setsail.com): "As boat owners continue to stretch the complexity of systems aboard, the temptation to riddle the hull with underwater through-hulls increases. Owners are often uninformed about the potential problems and risks associated with fittings below the waterline, and many builders and boatyards find it tough to deny the wishes of a paying client." 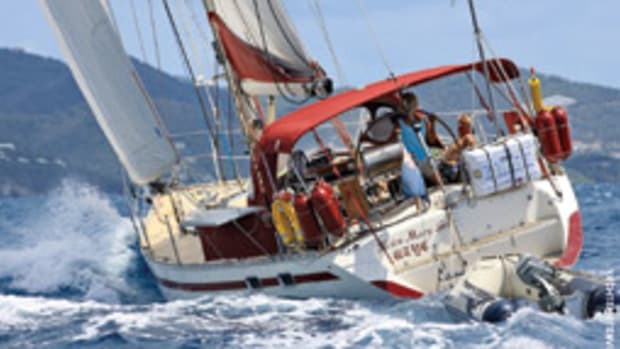 Kenneth Williams and his wife, Roberta, who cruised aboard a Nordhavn 62 for eight years and have been cruising a Nordhavn 68 for the last four years, have been following closely the online discussions about Melanie Jeanne&apos;s losses. "As a result of this incident I am reviewing all pump capacities," he writes in an e-mail. "That said, it isn&apos;t easy to add capacity, and capacity divides into two categories: at the dock and at sea. At the dock, I see the primary defense as the audible alarms, and at sea, the primary defenses are the high-volume pumps and having someone on board who can cork the hole in some way." Williams nonetheless suspects the issue was not the bilge pumps but the unfortunate sequence of unusual events: a botched repair, no one heard the alarm, a locked boat with no key around and the door to the watertight compartment left open. "Take away any of these and the boat may have stayed floating," he says. The yacht and its twin 740-hp MTU Series 60 diesels remained submerged for three days. Leishman says the insurer hadn&apos;t made a decision, but Melanie Jeanne could become a "constructive total loss" - the water damage too extensive and costly to economically repair. "It would be a huge endeavor to restore it to its original condition," he says.